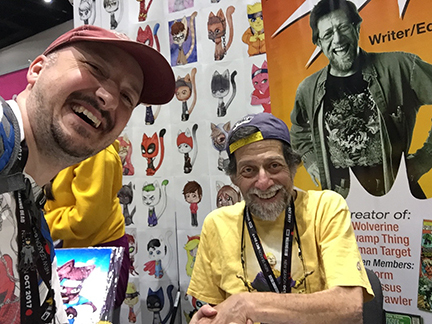 Len Wein: SNIKT! You'll be missed. It was one of those moments I wish I was recording footage. One of my most favorite superhero characters of all time, Colossus, his co-creator passed away. Now don't get me wrong, Wolverine has done his share and then some. Maybe too much. Colossus didn't appear in multiple films, but something about that armored Russian spoke to me. A hard outer shell with the soft artist inside. Someone I could strive to be like. Len breathed life into that character and for one of those myths that connect with you, I finally had an idea of what it was like to have armor skin. It's that hero power that Len needed during his last days. He explained to me how he broke his neck. "I tripped. That's it. There was a fold in the carpet I didn't see and I landed on my head. They fused it (his neck) but I'm in a awful lot of pain now." Len was often seen holding his head but always found a way to genuinely smile for every photo. Not the conversation you would want to remember someone by but for a first time encounter it sure made a hell of an impression. We did eventually steer into convention talk as I asked him about the idea behind the Wolverine. 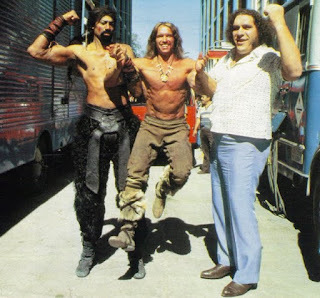 He shrugged, shook his head and said "...we needed a character so that's what I came up with." I'm sure there is more to that story as I've learned with talking to the greats, but he played it down real heavy like it was making a PBJ sandwich. I took the story for face value and downshifted to street rhetoric as you could see he was in terrible pain. 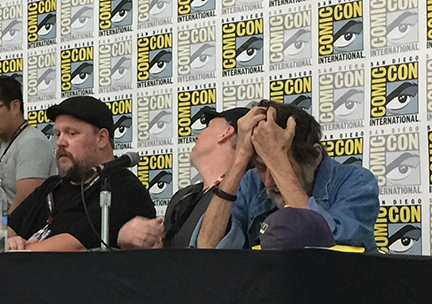 Len and company at Bernie Wrightson's memorial panel. 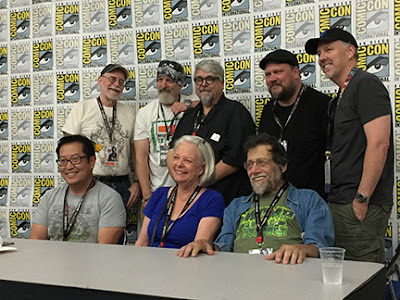 Len had attended the Bernie Wrightson memorial earlier that day. It was thrown together at the last moment to remember his ol' colleague and friend. Some great stories erupted from the panel including one about Bernie jokingly grabbing butts if he got to know you well enough. (That and if he had a few drinks...) Len wasn't a victim to Bernie's iron grasp, but shrugged off the question like water off a duck's back. He smirked because he knew the details checked out. My time with Len was always incredibly short. At earlier cons I would see him driving around in a little rascal and grab a photo then give him a quick tug of the writer's hand making sure to say "thank you". The first time I met him was at Sergio Aragone's Quick Draw panel several years prior. Mark (Evanier) pulled the spotlight onto the crowd of hundreds to introduce him. I was sitting in the same row, three / four chairs down. He stood up and waved to everyone with his signature curly hair and ball cap. I felt honored and lucky. Len's work spans decades. Lynn, (and everyone else who reads this), if you would give us more of a retrospect: How you knew of Len and the work you loved of his the most; it would give us another perspective. At the end I offered to help him with some aspirin and he politely declined as he had a son nearby that was taking care of him. He apologized that he wasn't in a position to really talk anymore as each word hurt worse. I couldn't even begin to imagine. His handshake was still firm. 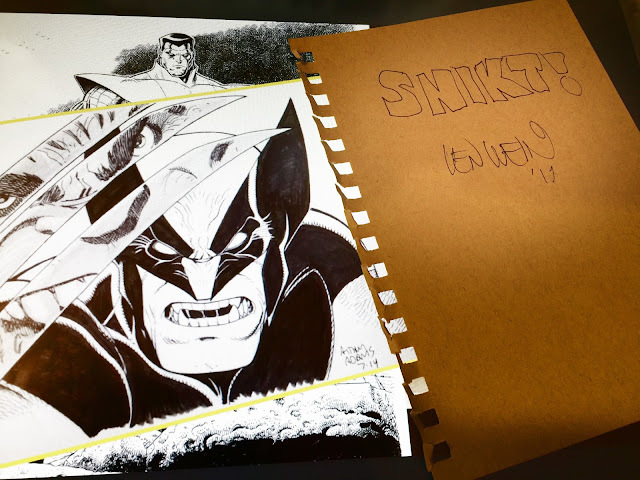 He signed a piece of sketchbook paper to me and even drew out the word "SNIKT! ", Wolverine's trademark claw sound. Len's personalized autograph with a "SNIKT!" for the road. I told him thank you for his creations again and slinked back into the crowd to leave the man some peace. That was the last I saw of him and for the brief encounters I've had, he always smiled genuinely for every photo as if that's how his mother raised him. He was kind, and open about his mind. He seemed to not give too much credence to celebrity, but instead appeared humble and grounded. Len deserved a better way to go, for those who were lucky enough to work with him, no layer of metal skin could protect. God speed Len and again, as always, thank you.